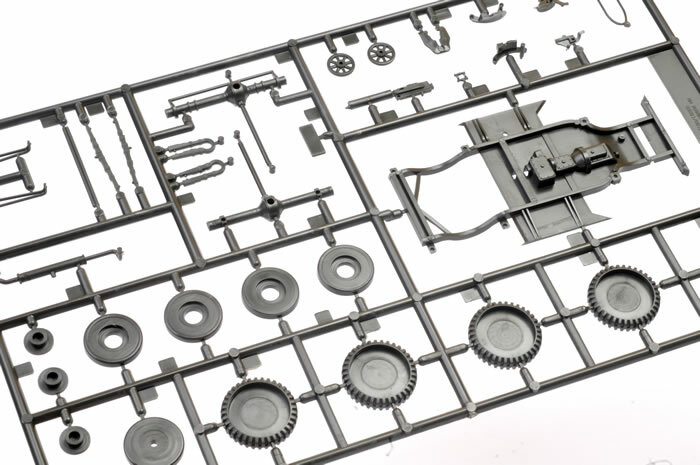 Media and Contents: 278 parts in olive coloured plastic, ten parts in clear and two black full-length flexible tracks. 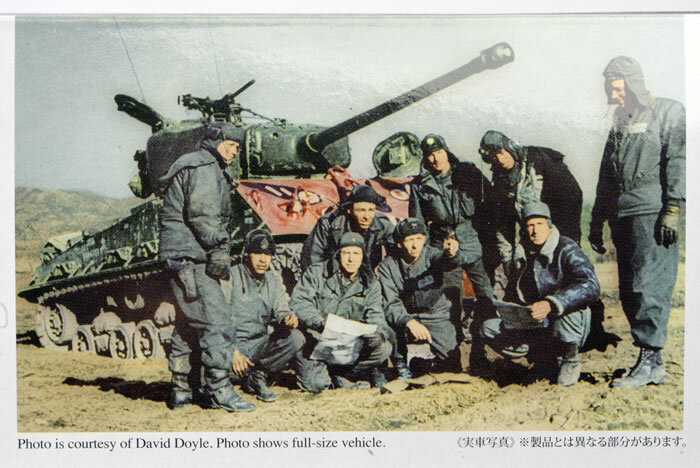 Advantages: High level of detail; excellent moulding quality; straightforward build; includes new parts specific to the Korean War version; includes two high quality crew figures. Recommendation: This is another interesting and useful addition to Tamiya’s new generation Sherman family. 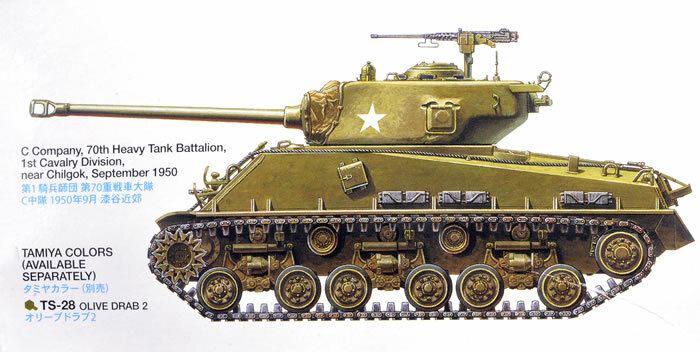 The M4A3 was the first Sherman variant to feature HVSS (Horizontal Volute Spring Suspension) as factory fitted equipment. HVSS suspension was equipped with wider tracks to distribute weight more evenly. These wider tracks allowed more armour to be fitted and offered a more comfortable ride for the crew, but also required narrow track guards to be fitted to the sides of the hull. 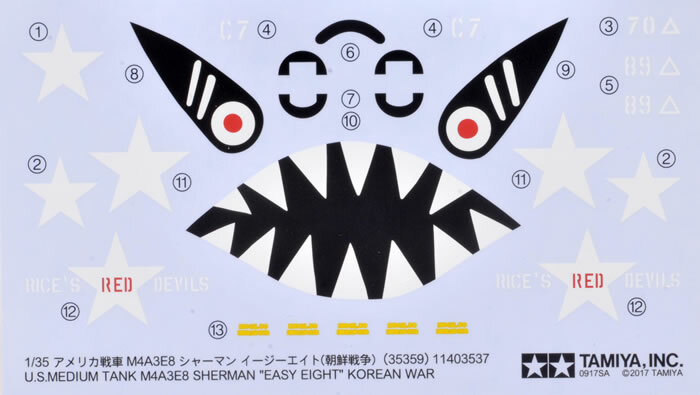 With its experimental E8 designation, the smooth ride of the HVSS led to the nickname Easy Eight for this Sherman variant. The M4A3E8 first entered service in Northern Europe during December 1944, and the variant continued on the front lines post-war, including service in Korea. In late 2015, Tamiya expanded its WWII Allied catalogue with a new 1:35 scale M4A3E8 Easy Eight Sherman. This kit had nothing at all in common with the Tamiya Easy Eight released around 1970. The 2015 kit was almost all new. 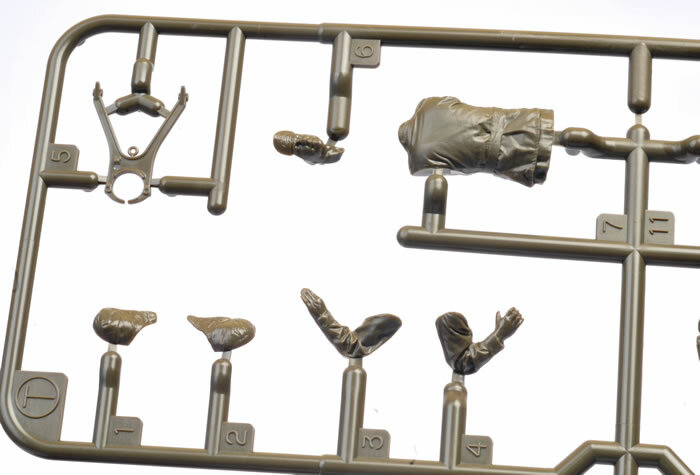 The running gear sprues are taken from Tamiya’s 2011 Israeli M51 release and the only other recycled sprue is the .50 cal machine gun, which dates from 1998. 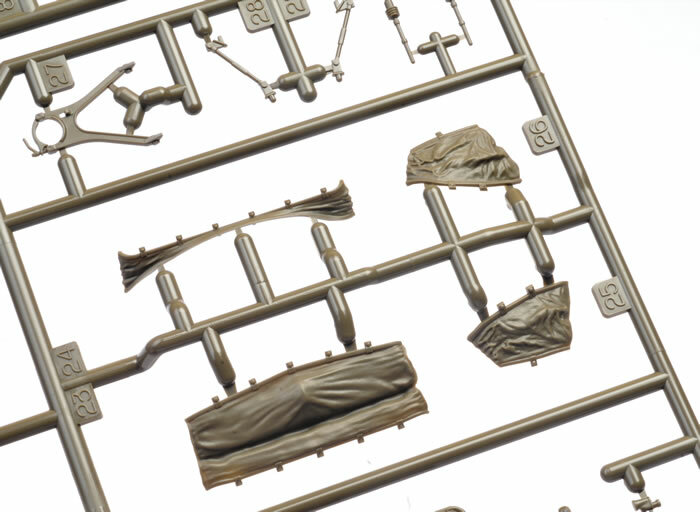 Tamiya has now expanded the family with a Korean War version of the Easy Eight. 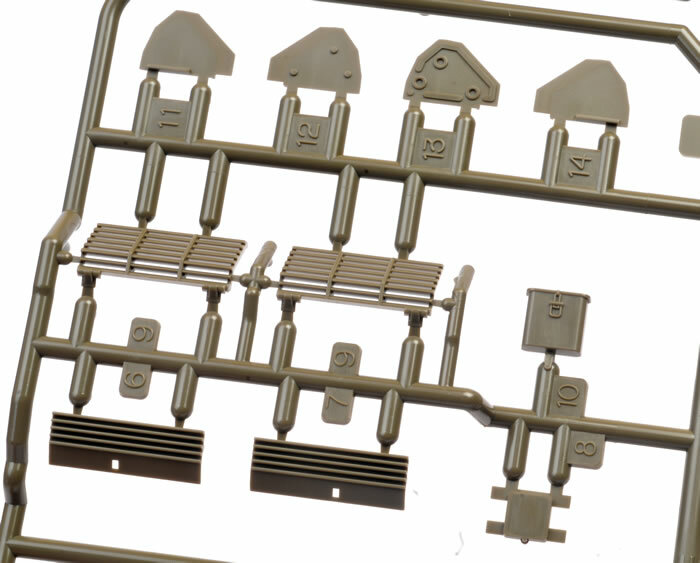 This model features T80 flexible tracks (these first appeared in Tamiya’s 2011 M51 kit), a brand-new sprue with two Korean War crew figures, an impressively textured mantlet waterproofing, a new engine deck and a very striking scheme for one of the two marking options. Tamiya’s 1:35 scale M4A3E8 Easy Eight Sherman comprises 278 parts in olive coloured plastic, ten parts in clear and two black full-length flexible tracks. Tamiya has also included the venerable 1:35 scale GAZ-67B Field Car as a bonus in the box. The Sherman kit features the T23 turret with the oval loader’s hatch and subtle cast texture wherever appropriate. The running gear includes the later Horizontal Volute Spring Suspension (HVSS) suspension units, and full-length flexible T66 tracks. All of the other key features of the M4A3E8 are there too, including the 47° glacis hull with the enlarged hatches, the correct rear deck configuration and 76mm gun barrel with muzzle brake. The lower hull is made up from a “flat pack” arrangement of separate floor, sides and engine firewall. 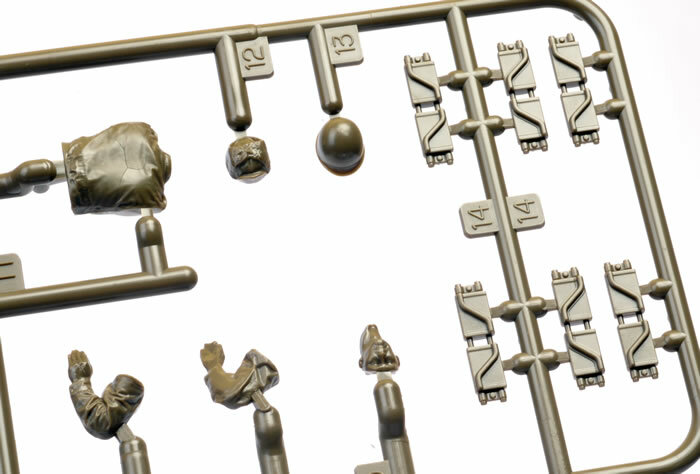 The track guards and sponsons are cleverly moulded as one piece per side. The diagonal supports are supplied as separate parts. 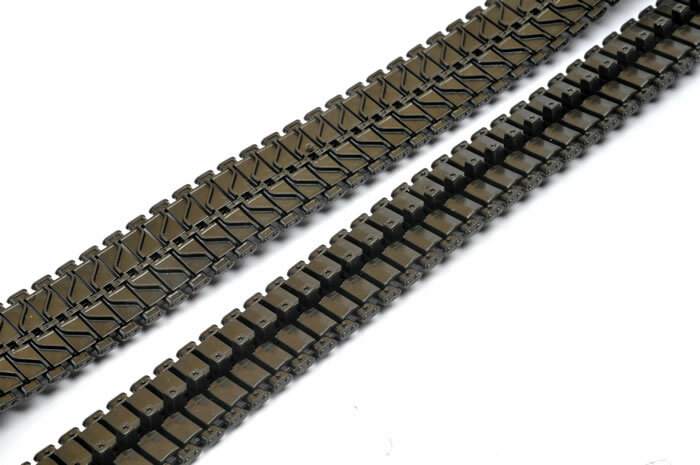 Detail on the new T80 tracks is very good. The guide horns are moulded onto the tracks with an indentation front and rear to suggest the hollow nature of the real thing. There is one raised pip on the inside of every 16th link, but these will hardly be visible once the tracks are fitted. The tracks may be fixed with regular plastic glue. Note that the idler wheel mounts are also workable track tensioners. Do not glue these parts in place initially, as you may want to swing the arms to tighten the vinyl track when it is installed. The Commander’s cupola features separate clear vision blocks fitted from the inside. All hull and turret crew hatches may be posed either open or closed. A pillar-mounted .50 cal machine gun is also supplied. The package is rounded out with two nicely moulded and animated crew figures. Markings are printed in register and colour saturation looks good. Tasca has set the standard for Sherman kits for nearly ten years, so comparisons between Tasca’s 2010-release 1:35 scale Easy Eight and Tamiya’s new kit are inevitable. Both look great when complete, but the approach of the two kits is markedly different. 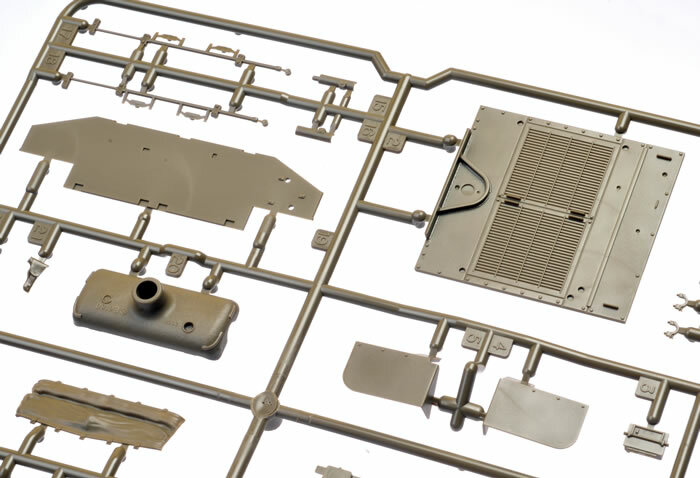 Whereas Tasca’s kit comprises more than 800 parts, Tamiya’s is less than 300. A good example of the different design philosophies is the running gear. 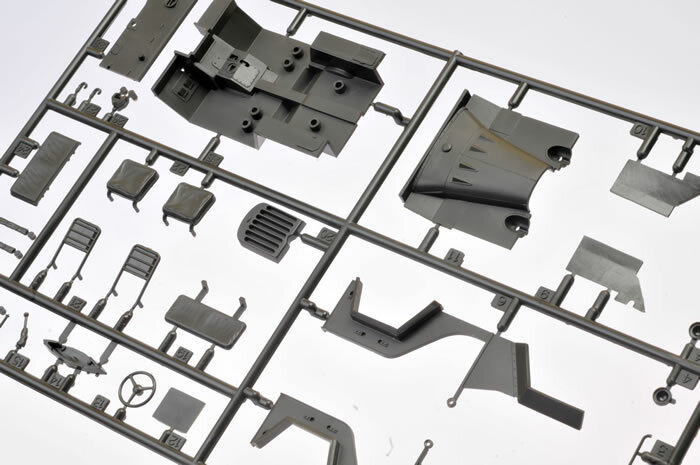 Tasca’s suspension units are made up from 17 pieces, and will be articulated when assembled. Tamiya’s are made up from eight pieces, including the road wheels. The only compromise is lack of articulation – the running gear can be posed any way you want as long as it is flat on the ground. For most modellers, this will not be an issue. 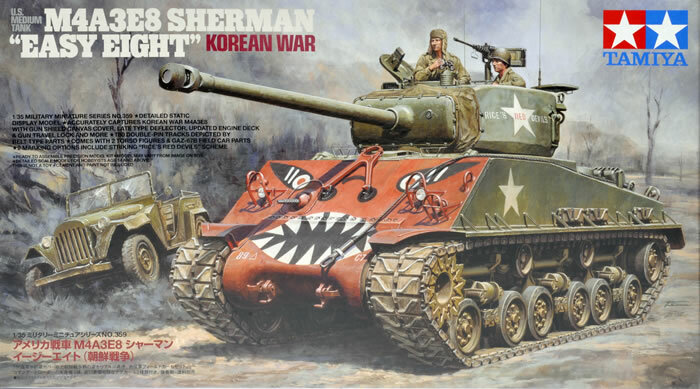 This is another interesting and useful addition to Tamiya’s new generation Sherman family.